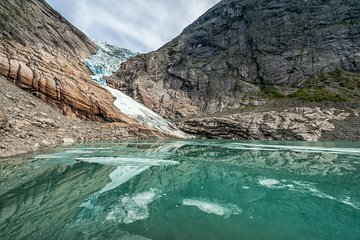 Descubra uno de los impresionantes glaciares de Noruega en esta excursión de 4 horas por la costa desde Olden. Después de un viaje por carretera a través del valle, salga en una caminata de 1 hora, pasando por las sorprendentes vistas panorámicas de montañas y cataratas. En la cima, tendrá unas vistas espectaculares del glaciar Briksdal, un brazo del extenso glaciar Jostedal, y finalice la caminata con vistas al lago glaciar. Disfruta de magníficas vistas al glaciar, montañas y cascadas. Los tours salen a poca distancia del puerto de cruceros. We really enjoyed this trip. our guide was very helpful. Excellent trip with lots of information on the area from our guide Johan (apologies if that's the wrong spelling). Although the group was made up of Germans and British, Johan was able to provide excellent commentary to all - I assume in German too!! The Viator sign was easy to find at the port and the trip was exactly as described - around 45 minutes to get to the drop off point, then the walk to the glacier itself - awesome! We had pretty much all the time we needed at the glacier before returning to the drop off point and return to the dock in plenty of time for sailaway. The mini-bus was really plush and comfortable. Would thoroughly recommend trip and will be using Viator again for future trips - far better value than the ship excursions.